When you thinking about making the best intricate designs, you think the scroll saw. When you think about making excellent and accurate cuts, you think of the band saw. The band saw and the scroll saw are two woodworking tools that can be used for different woodworking tasks. With both tools being considered with some confusion over time, this discussion of ‘scroll saw vs band saw’ becomes worthy. Let’s take a thorough look into these two mechanically powered saws. A scroll saw is a woodworking machine that allows users to make intricate designs on wood pieces and curved lines on patterns. As a versatile tool, it can also be used to make a number of cuts and is best only for softwood material. In making use of the scroll saw, wood pieces are passed through the saw in the manner in which a cloth is passed through the needle. The users peddle the machine as the desired design is replicated on the wood piece. The band saw is an adjustable cutting tool that can be used in cutting a number of materials and for carrying out other woodworking projects. It is best for all wood material types both soft and thick; large and small. Working at an impressive speed, the band saw can be used in making straight line cuts, angle cuts, and curve cuts. In using the band saw, you have much control over the saw as you are able to make use of your hands to move the wood while sawing with the band saw. This contributes largely to its being an accurate tool to achieve precise results on a woodwork project. When you require a high level of detail and accuracy for a project: The level of detail and accuracy needed differs from one project type to another. However, when a high level of detail is needed, then the scroll saw is the best saw to be used. When you need a saw with a foot pedal. The scroll saw has been designed in such a way that it comes with a foot pedal. This way, you are able to pedal the machine as the wood passes through it the same way you will pedal a machine. When you need excellent intricate designs on wood pieces. When it comes to making an intricate design, the scroll saw is second to none in the market. The scroll saw makes you to creatively make wood pieces after the order of anything or into anything you desire. When to Use a Band Saw? Band saw offers a wide variety of applications just like a scroll saw. When looking to produce high-speed cuts. The band saw makes it very easy for a woodworker to effect high-speed cuts especially at varying angles. The high-speed ability of the band saw puts it ahead of other saws. When looking to make moderately accurate cuts: The band saw is also best to use when a woodworker making a cut wants to maintain precision. Asides from precision, with the band, saw, moderately accurate results are possible. The band saw and the scroll saw offers a number of uses as much as they are also limited in a number of ways. These limitations of both saws are what is being referred to as their cons. taking a cue from the many reviews of customers, we have been able to highlight a number of limitations of both the scroll saw and the band saw. The scroll saw cannot work well with hardwood. Working on the hardwood with the scroll saw seems almost impossible. In a bit to try to make use of the scroll saw on the hardwood, you are most likely to cause damage to the blade or the machine as a whole. It will also require a whole lot of stress and might affect the accuracy of the eventual outcome. The scroll saw is also limited in its ability to be used for larger workpieces. Over time, the scroll saw has been known to be more favorable with wood pieces that are smaller in sizes than it would with larger sizes. This has been attributed to the thin nature if its blade and the relatively average table size of the saw. The scroll also is also limited in the number and types of cuts it can be used for. This is unlike the band saw because the band saw is more of a versatile cutting tool than the scroll saw is. However, following the right techniques, you can always maximize your opportunities with a scroll saw. The band saw just like the scroll saw is limited in a number of ways. However, from the many reviews gotten from a band saw users, its major limitation has been its expensive price to quality ratio. An average band saw is not just more expensive than the scroll saw, but many of it ranges in price as much as thousands of dollars making it less purchased on the market. There are safety rules applicable to the uses of both saws to ensure protection from occupational hazards. While professionals don’t mind going for the more complex saws, it is best for beginners to exercise care when choosing. While the band saw requires less skill to operate than the scroll saw because of how complex the scroll saw is, the scroll saw is safer to use than the band saw. The band saw has a really sharp blade and it is always very difficult to put your hands away from the blade while in use. Expense wise, the band saws are way more expensive than the scroll saw and as scared a lot if woodworkers away from it especially when you consider the versatility of the scroll saw. So if you have a less budget with a project design that the scroll saw an effect, then it is best to go for the scroll saw and save yourself some cost. You would not want to have a woodworking tool that breaks down every now and then. This makes maintaining the saw very necessary and should be done from time to time. The maintenance requirement of the scroll saw is higher than the band saw as you can clean the band saw in a few minutes. To clean the scroll saw, you will have to disassemble the parts and pick one after the other exercising so much care and attention. So, Scroll Saw or Band Saw? Bandsaw or scroll saw, which should I go for? This has always been a tasking question, answer to which lies in the choice of the user and the project type. This has been a very difficult task for woodworkers to decide considering the many other factors to note. While it is best for a beginner woodworker to go for the band saw because of how simple it is to use, it’s high cost still remains a major challenge to bore. On the contrary, professionals can go for the scroll saw considering the expertise required to operate it. The inability of the scroll saw to work well with hardwood pieces has still remained a major challenge for professionals. So it is best to say that provides you have the budget too, getting both the scroll saw and band saw won’t be a bad idea for you as a woodworker. 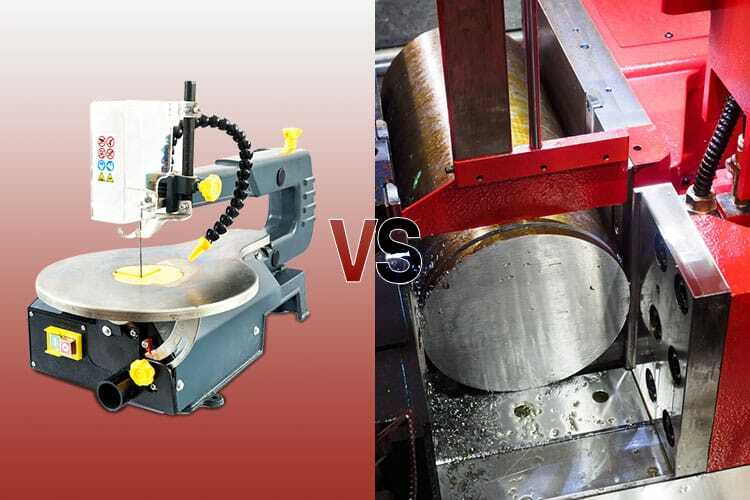 Scroll saw vs band saw is a comparison that will last a lifetime in the field of woodworking. With both machines being very important to different work projects to be carried out by the woodworker, choosing one over the other is difficult. Picking a good band saw or a scroll saw depends on three major things. The first is the woodworking project that is at hand; the second is the user’s taste in saws and the last is the budget you have at hand to get one. When all of these factors have been considered alongside understanding the difference between scroll saw and band saw, choosing becomes easy. 3 How to Use a Scroll Saw for Some Intricate Woodworking Tasks?